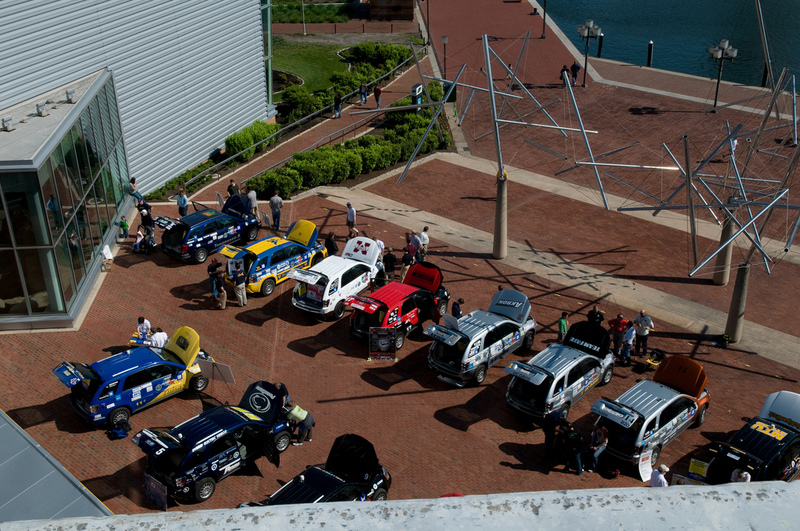 Vehicle Design Strategy: The Michigan Team vehicle design was a through-the-road parallel hybrid vehicle. The 2.0-L four-cylinder engine was mated to a four-speed automatic transmission powering the front wheels. The 55-kW Solectria electric motor along with a Cobasys 288V battery pack transmits power to the rear wheels. These two drive systems were coupled together through the vehicle’s control system. The vehicle had several other new and innovative features as well. Major changes were made to the vehicle in order to save weight. The greatest savings was accomplished by replacing the glass windows with custom-made polycarbonate windows and replacing the stock rear seat with a GM production seat that weighed 70 pounds less. Aerodynamic improvements included rear fender skirts, an improved front air dam, and an underbody panel. Vehicle Design Strategy: The MSU Challenge X team designed a parallel through-the-road, hybrid Equinox that was charge sustaining, had high consumer acceptability, was production feasible, and was capable of meeting both the team’s and competition’s performance requirements. 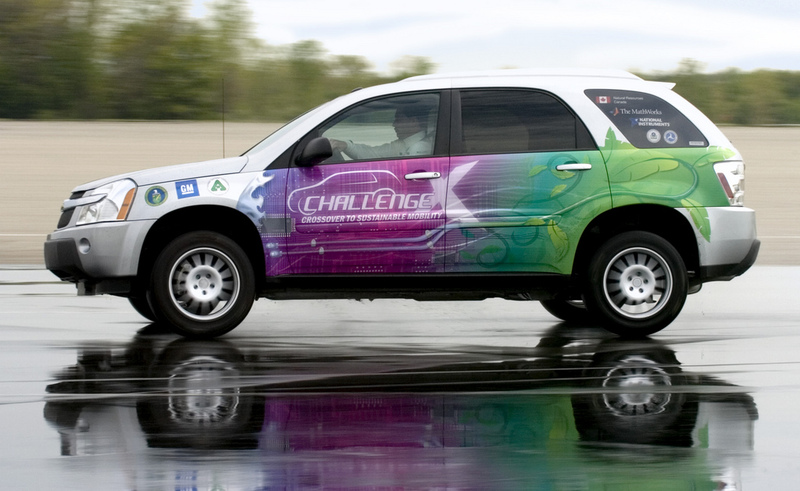 The MSU Equinox incorporated a 1.9-L GM turbo diesel engine fueled with B20 biodiesel powering the front wheels. Both a Ballard IPT AC induction electric drive transaxle and Johnson Controls NiMH battery pack were used to drive the rear wheels. The hybrid control system was implemented by using the MotoTron/MotoHawk hardware and development tools. Vehicle Design Strategy: The Ohio State’s Reverb Hybrid Equinox was a split-parallel through-the road configuration. A 67-kW Ballard transaxle powered by a 300-V NiMH battery pack and 10.6-kW BAS permitted downsizing the combustion engine from the production 3.4L V6 to an efficient 1.9-L GM turbo-diesel. The engine/BAS is mated to a 6-speed automatic transaxle powered the front wheels and the rear electric drive powered the rear wheels. The system had all-electric launch and idle-off capability for improved efficiency and decreased emissions. Emissions were further reduced through an advanced, maintenance-free, lean–Nox trap and particulate filter (DPF-Oxycat) system. Upgraded braking components and an integrated driver infotainment center, coupled with the stock Equinox’s plush but taught handling, made driving a treat. The Reverb retained its full stock seating and cargo capacity which provide the full functionality of the original vehicle. Vehicle Design Strategy: Rose-Hulman’s vehicle utilized a power split architecture with a 2.5-L VM Motori common-rail turbo diesel engine that runs on B20 biodiesel. The engine featured a custom one-mode transmission, which used two proprietary 60-kW electric machines. The drivetrain was modified to be exclusively rear-wheel drive and featured a Cadillac CTS limited slip differential. 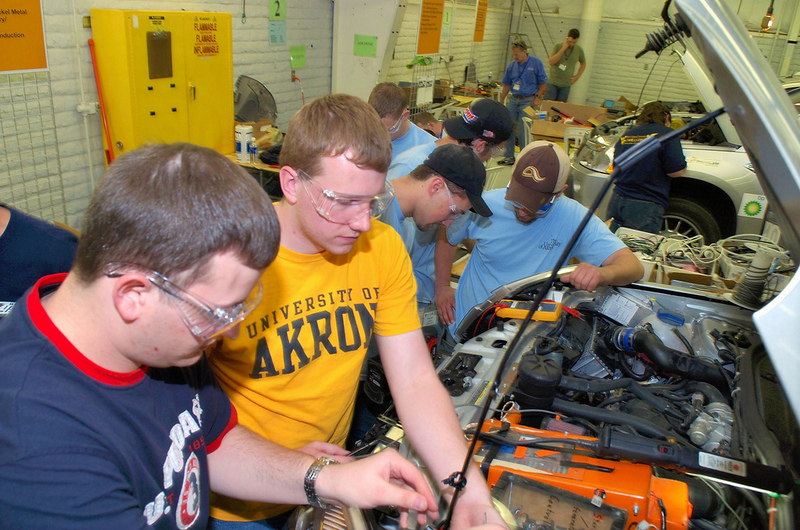 The control strategy was developed by using the Rose-Hulman model-based design process in which MATLAB, Simulink, and automatic code generation were used to produce the embedded control code, which was then downloaded onto a MotoTron MotoHawk® ECU. Rose’s vehicle used a Cobasys 8.5-kWh, 336-V NiMH battery. 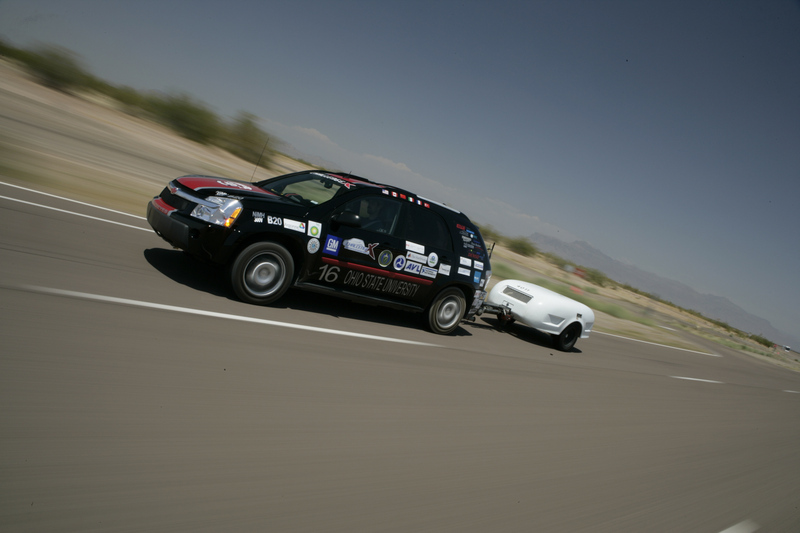 Vehicle Design Strategy: SDSU’s “Frequinox” had a combined 275-kW of muscle to propel the 4400-pound crossover SUV from 0-60 MPH in five seconds while achieving 30mpgge. The 1.9-L GM direct-injected turbo diesel engine running on B20 biodiesel fuel produced125-kW of power and was coupled to a 6-speed manual transaxle powering the front wheels. The electric drive consisted of an AC-Propulsions AC-150 150-kW induction motor powered by a custom 400-V NiMH battery pack. The motor was mated to a Chevrolet Cobalt SS transaxle and powered the rear wheels. The overall vehicle control hardware was a Mototron ECU running proprietary SDSMT control software. The control software automatically sensed driver intent and optimizes for power or efficiency. Vehicle Design Strategy: The Texas Tech Equinox was a mild hybrid vehicle powered by an E85 and hydrogen-fueled 2.4-L GM Ecotec four-cylinder engine, a 4-kW belt drive alternator-starter or BAS, and a 36-V NiMH battery. E85 was the primary fuel; however, a second set of injectors provided small amounts of hydrogen to the engine to improve efficiency and emissions and to aid in cold starts. Torque was delivered to the front wheels via a GM 4T45E 4-speed automatic transmission. The BAS provided the capability to shut the engine down during stops, and it allowed for limited regenerative braking. A 10-kW hydrogen fuel cell, mounted in the rear cargo area, provided all electrical power for the vehicle’s 12-V and 36-V systems. 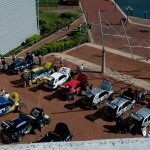 Vehicle Design Strategy: The University of Akron’s Equinox, affectionately nick-named Joey, used a through-the-road parallel hybrid system. A 1.9-L biodiesel (B20)-powered VW engine drove the front wheels through a 6-speed Manumatic transaxle and a 67-kW Ballard transaxle powered the rear wheels. Emissions were mitigated with after-treatment technologies. A unique feature of the vehicle was the use of Nesscap ultra-capacitors for energy storage, which allowed for rapid charging and discharging when compared to batteries. Emphasis was also placed on performance capabilities and drive quality for an enjoyable consumer experience. Vehicle Design Strategy: Trinity (the name given to the UC Davis Equinox) was a pre-transmission parallel plug-in hybrid. A 1.5-L Atkinson cycle engine running E85 was mated to a custom-designed CVT incorporating a 75-kW permanent magnet motor. The rear wheels were driven by a 60-kW En ova electric transaxle. A custom 346-V lithium-ion battery pack served for energy storage. The highly efficient configuration could propel the vehicle for 45 miles on electric power alone and achieved a 100% increase in fuel economy over the production version. If the ESS was charged from a renewable source, such as solar or wind-generated power, this vehicle would become a highly sustainable transportation solution. 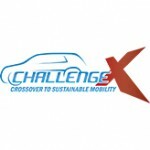 Vehicle Design Strategy: As the only series hydraulic hybrid in Challenge X, the U-M vehicle had a unique powertrain design. A hydraulic hybrid typically generates power and accepts charge faster than electric hybrids, increasing the amount of energy that is recaptured during braking. This system has the potential to achieve a 77% increase in fuel economy, especially in stop-and-go situations where the regenerative breaking system is most effective. A 1.9-L GM direct-injected turbo diesel engine powered a bent-axis pump that stored charge in a nitrogen bladder accumulator. A 55-cc/rev hydraulic motor powered the wheels. 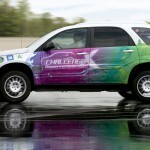 Vehicle Design Strategy: Tennessee’s vehicle was the Revolution X, a parallel through-the-road diesel electric hybrid. The Revolution X had a 1.9-L GM direct-injected turbo diesel and ran on B20 biodiesel fuel. A 67-kW Ballard transaxle powered the rear wheels. The vehicle utilized a number of advanced diesel exhaust after-treatments, including an ammonia SCR system for NOx reduction. A Cobasys 288-V NiMH battery pack powered the hybrid drive system. The Revolution X was painted Le Mans metallic blue and had styling cues from the Pontiac Torrent and Saturn Vue. The Revolution X went through extensive noise reduction as well. Vehicle Design Strategy: At the University of Texas, the Challenge X team adopted a strategy of brilliance in simplicity. The UT Equinox used fuel through the 1.9-L GM direct-injected turbo diesel and 6-speed manual transmission. The hybrid system employed a 36-V belt alternator starter system from the Saturn Vue Green line, in order to have the engine off at stop lights and provide acceleration assist. To treat the diesel emissions, the UT team implemented a diesel particulate filter and lean NOx trap. The central controller was a 128-pin Mototron Motohawk ECU, which controled the engine, accessories, and hybrid system. The hybrid also featured creature comforts such as virtual hybrid gages, electric A/C, GPS navigation, and MP3 connectivity. Vehicle Design Strategy: The University of Tulsa team created a parallel through-the-road hybrid vehicle with supplemental accessory power provided by a removable HTUGo skid with 1.2-kW Ballard Nexa fuel cell. A 1.9-L GM diesel turbocharged engine mated to a GM F40 6-speed manual transmission poweredthe front wheels. A 67-kW Ballard AC induction transaxle motor charges the COBASYS 288-V nickel metal hydride battery and powered the rear wheels. B20 fuel, the Umicore SCR system, and GM particulate filter combined for low emissions. Special features of the vehicle included the City-Standard transmission, which did not require the driver to shift gears in stop-and-go traffic, and the TUCX panel that provided guidance to the driver for optimizing fuel economy. Vehicle Design Strategy: Unique within Challenge X, a polymer electrolyte membrane (PEM) fuel cell was used as the primary power source for UWAFT’s powertrain. A 65-kW HyPM Hydrogenics fuel cell converted the energy carrier hydrogen into electrical energy and water. This electrical energy was used to drive two 67-kW Ballard electric motors. When the power demand exceeds what could be provided by the fuel cell, a 60-kW Cobasys battery pack provided the necessary power to meet heavy accelerations. UWAFT’s all-electric powertrain was designed by using PSAT for component sizing and vehicle simulation. Due to the fuel cell’s cold-weather testing limitations, UWAFT relied extensively on hardware-in-the-loop (HIL) and software-in-the-loop testing. This helped UWAFT develop controls software with minimal access to vehicle testing. Vehicle Design Strategy: The “Moovada” was a parallel though-the-road hybrid. A 65-kW Ballard IPT powered the rear wheels, while the front wheels were powered only by the 110-kW 1.9-L GM direct-injected turbo diesel engine. The team selected B-20, a 20% biodiesel, 80% diesel blend, for its fuel and used a 6-speed manual transmission to obtain the best fuel economy. Powering the electric drive was a pack of JCI Ni-Mh cells that had a nominal voltage of 288 V and are rated at 7.2 Ah. The Moovada ran approximately at 35 to 38 mpgge while using a urea injection system to eliminate 90% of GHG emissions. 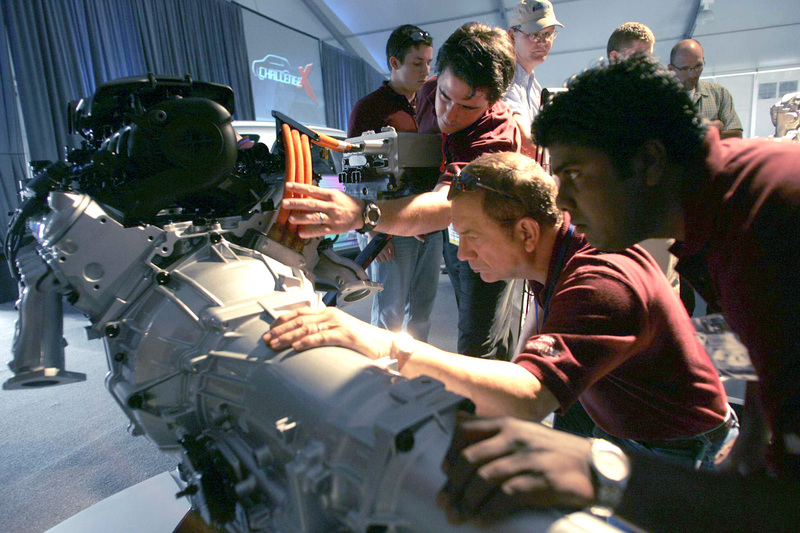 Vehicle Design Strategy: In the beginning of the Challenge X competition, the Hybrid Electric Vehicle Team (HEVT) decided to use a split-parallel hybrid architecture and use E85 fuel in its Equinox RevLSE. To achieve this design, HEVT used two electric motors. The highvoltage belted alternator/starter (BAS) was belted directly to a Saab 2.3-L BioPower engine coupled to a 5-speed manual transmission to power the front wheels, while a rear traction motor (RTM) supplied power to the rear wheels to maintain all-wheel-drive capabilities and provide performance assist. This setup allowed the vehicle to use both motors in parallel power paths to assist the engine or allowed use of a series power path when the BAS is used to charge the 336-V NiMH battery pack. Vehicle Design Strategy: WVU used a GM direct-injection turbo diesel engine fueled by B20 bio-diesel fuel. A Maxwell ultra-capacitor energy storage system (ESS) with PML/flight link wheel hub motors powered the rear wheels. The distinct separation of propulsion sources made this vehicle a through-the-road parallel system. The power for the rear wheels came from either regenerative braking or the engine-mounted generator. This energy was then used to power the car during acceleration. During limited traction scenarios, the car used the engine-mounted generator to charge the capacitor bank when necessary. To lower emissions, a diesel particulate filter, an oxidation catalyst, and a selective catalytic reduction system (SCR) of team design were incorporated into the exhaust system. The use of biodiesel caused substantial reduction in unburned hydrocarbons, carbon monoxide, and particulate matter when compared to emissions from regular diesel fuel. A urea system was incorporated into the exhaust system to further lower NOx emissions.